The genius of Jacques Guerlain is clearly expressed in two adored fragrances: Mouchoir de Monsieur (1904) and Sous le Vent (1934). Mouchoir de Monsieur is one of the noblest expressions of civet I know and Sous le Vent is a classic green chypre in the tradition of Coty's sublimely rough-hewn Chypre (1917) with animalic base and typical Guerlinade heart of iris, rose, tonka and amber. These are old scents which are fresher, newer and, yes, much less predictable than practically any scent to come from one of the major houses in the last twenty years. While Sous le Vent has long been unavailable from Guerlain, it is obtainable at the Paris boutique for the near future. Mouchoir de Monsieur grows scarcer and scarcer in the retail marketplace, but, hope springs eternal, as it very nearly duplicates that perennial bestseller (supposedly beloved of Mr Jagger): Jicky. I prefer the animalics of Mouchoir when offsetting a natty outfit (Mr Ford could learn a few things from JG) while Sous le Vent's drydown makes me want to nuzzle up to myself. Surely, if you're bothering to read this you know Ronald Firbank, the ür-aesthete. I couldn't pass up this quotation from his novel The Flower Beneath the Foot (1923): "Lying amid the dissolving bath crystals while his manservant deftly bathed him, he fell into a sort of coma, sweet as a religious trance. Beneath the rhythmic sponge, perfumed with Kiki, he was St Sebastian, and as the water became cloudier, and the crystals evaporated amid the steam, he was Teresa... " Contained in Firbank's caricature of some fellow sybarite, there's a definition of luxury, a definition which American advertising continues to leverage ... the attainable, unattainable life located as it were between absolute ascesis and utter excess. You don't have to be a Jungian or a Bettelheimian to admit the archetypal importance of basements in a child's fantasy life. Being beneath the earth in a cool, dry-damp place with the relative reminders of dirt, earthworms and decaying matter can be both comfort- and anxiety-inducing. 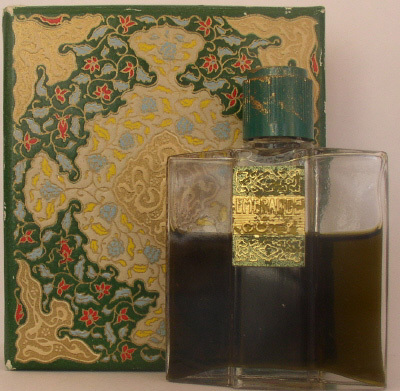 Maitre Parfumeur et Gantier's Route du Vetiver (1988) brings me there every time, in its super-charged moist, rooty stinkiness, which I love. 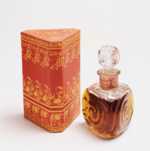 It is the vetiver of torrid summer days and hot-weather eroticism. On the other hand, there is Etro's Vetiver (1989): sharp, stalky vetiver, unalloyed (at least at the front end) and unforgiving. That is the desert vetiver, the hermit-poet's scent. It reminds me of the eaves of my grandparents' house and the uppermost rooms of an ancient mas in the South of France. Both are deeply introverted scents. I first started wearing the Etro interpretation of this classic accord a year or so into my doctoral studies. Just now, I am finishing my second bottle purchased on Good Friday 2003 in Como, Italy. Even the color of the liquid––brass––takes me somewhere. It is the hue of a good Meursault. It all started with me standing on a kitchen chair at the wet bar in my father's Fifties-era den. I would methodically open the various gold-wrapped and tassled thousand-year-old cream sherries and blended whiskeys, mix them in small glasses and then incline my infantile proboscus to study the scent. Short of a wee nip while preparing a hard brandy sauce for my English grandmother's plum pudding, I can't recall ever imbibing. Likewise, I guess as any curiosity-propelled tot, I opened the various bottles displayed at my grandmother's makeup vanity: Coty's Emeraude stands out in my mind.